When walking along a beach, it’s not unusual for people to pick up a pretty shell. But it takes someone with a fantastic imagination to look at a seashell and think, I could design a house based on that shape! The Seashell is a striking architect-designed home which has come on to the market for the first time. 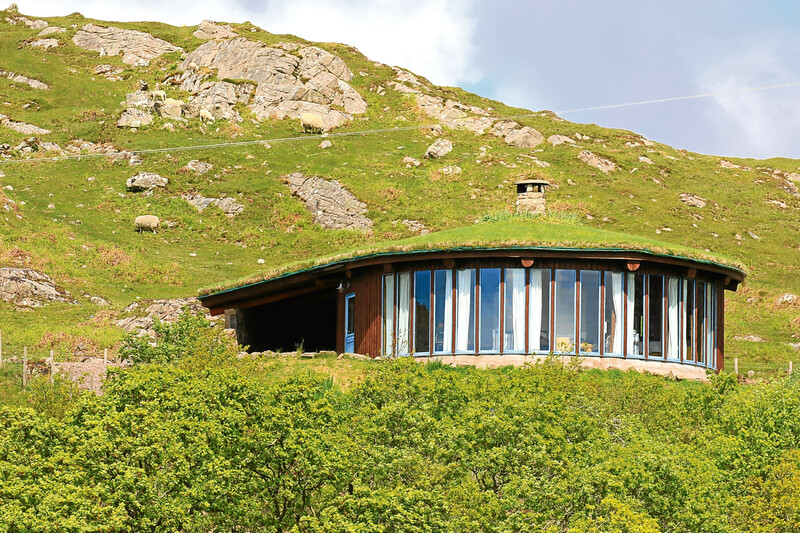 It is unique – and spectacular, and as the name suggests, the south-facing house follows the shape of a shell and has curved walls, floor-to-ceiling windows offering uninterrupted views of the countryside, Loch Sunart and the Morvern Hills beyond. This is a home like no other. A house not only designed as an idyllic romantic getaway but one which blends beautifully with its idyllic, naturally beautiful surroundings. It was built using a host of natural materials including wood from nearby forests. 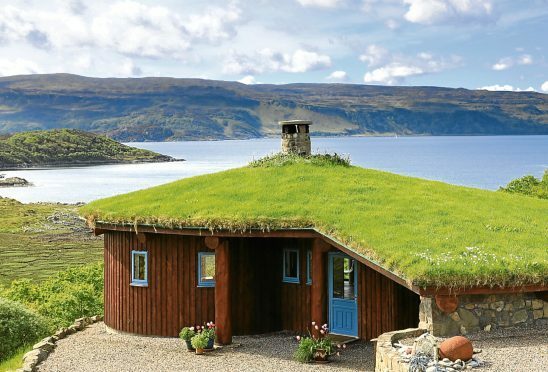 Huge tree trunks have been used to create a living grass-topped and wild-flower covered roof, as well as the handmade doors inside. The house, on the market at offers over £250,000, has been run successfully as a five-star holiday let by the owners, who are also selling two other properties in the area (Aspen Lodge and Brightwater Lodge) but The Seashell would also make a fantastic permanent home. 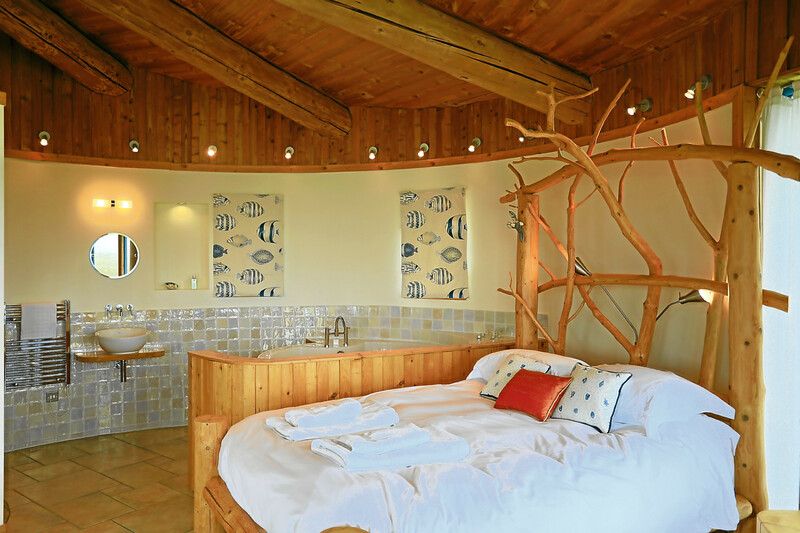 Built to a very high spec, it has a super array of contemporary ‘must haves’ including an elevated, double spa bath, wet room, separate shower, circular open fire place, under-floor heating and state-of-the-art lighting. High-quality windows and ceramic tiled flooring help keep maintenance to a minimum while an air source heat pump, solar thermal panels and extensive use of glass make the most of solar gain. The house is wrapped with attractive wooden cladding providing a low maintenance outer shell while the cleverly designed turf roof extends out above the main entrance and to the side to create a large covered area between the house and the edge of the drive. This covered space includes the air source heat pump, drying lines, wood store and has ample room for a table and chairs. The delightful garden extends down beyond the house towards Loch Sunart and includes a lawn, while a sloping grass verge between the house and the lawn provides an ideal location for the solar thermal panels which can’t be seen from the house. The garden is full of mature plants, fruit bushes and pretty foliage while the driveway can accommodate several cars. It extends beyond the house to the far side where there is a stone-built BBQ and path leading down to the lawn. In addition to the house, there’s a plot of land either for sale as a whole or separately following the sale of the house. The plot is approximately 0.5 acres and comes with full planning permission for an additional dwelling house. Moorings are also available through the Crown Commission while the jetty at Salen provides berths for visiting yachts. 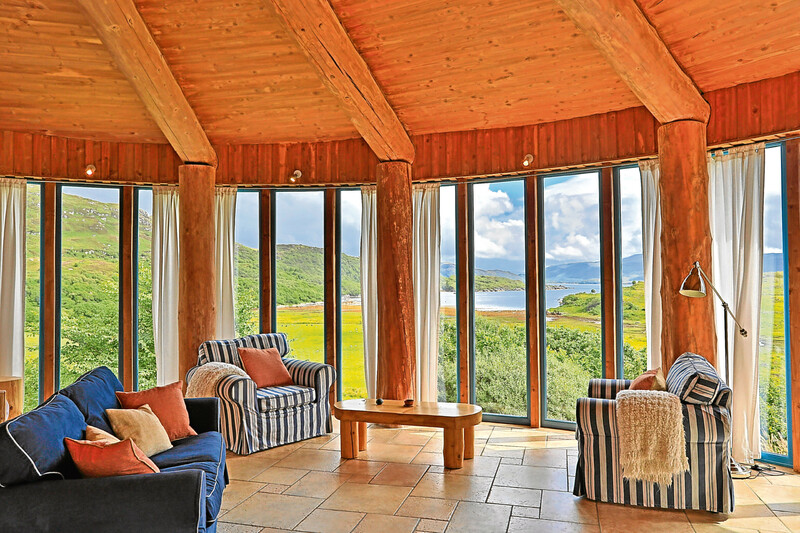 The Seashell is in Acharacle, Ardnamurchan, and perfectly placed to take full advantage of the wildlife and diverse scenery including moorland, lochs, forests and beaches for which Ardnamurchan is known. Not far from here there’s an RSPB reserve. Glenborrodale is also the location of a Natural History Visitor Centre with cafe and shop and the Ardnamurchan Lighthouse is close by. Contact Galbraith on 01463 224343.